If you are looking for Havells Max RO UV review then I must say you are at the right place. Let’s start with the overview of this water purifier. Havells Max RO+UV comes with a very unique looks and it comes with 7 stage water purification. The unique part about this water purifier is that, it has a very unique design which allows it to fit in the corner very easily. Usually water purifiers comes with 6 stage water purification but this water purifier has 7 stage water purification system. And I must say it has a pretty solid water purification system. But this water purifier also comes with a bit more expensive maintenance cost. To check customer reviews at Amazon click here. As mentioned above Havells Max has a very unique design which allows it to fit easily in the corners. This water purifier can also be mounted on the flat wall as well. Also this water purifier can be easily placed on table as well. It also has partially transparent water storage tank which really add to its modern look. The tap of this water purifier is also very unique and it provides convenience while dispensing water. This water purifier also comes with Zero Splash Faucet which basically benefits hygienic water and smooth water flow while dispensing water. This water purifier also comes with a glass holding tray which is pretty convenient. The glass holding tray is detachable so if you want to fill a large bottle you can easily remove the glass holding tray and fill your water bottle. This water purifier also has a decent notification indicators at the front. Power and error indicator– As the name suggests it will notify you whenever the water purifier is on or working and it will also notify you in case of any error. Purification process indicator– This indicator will notify you whenever the water purification process is running in the water purifier. Full tank indicator– As the name suggests this indicator will notify you whenever the water storage tank is completely filled with pure water. So you may be thinking when the full tank indicator blinks then you will have to stop the water purifier or turn off the water purifier manually but fortunately this is not the case it is a fully automatic water purifier so you don’t need to manually turn off the water purifier it will automatically stop the water purification process. And it will automatically start the water purification as well. Mostly water purifiers comes with maximum 6 stage water purification system but Havells Max RO UV comes with 7 stage water purification system. Now let’s have a closer look at each stage or filter and it’s working. Sediment cartridge remove the sediments from the water like clay or dust particles. The activated carbon cartridge remove bad taste and odour causing contaminants from the water. The reverse osmosis membrane is consist of very minute pores. Water is passed with a great force through this membrane which allows water molecules only to pass through it and blocks all the dissolved solids and salt from the water which ultimately reduces the TDS of the water. It basically converts hard water into soft water. 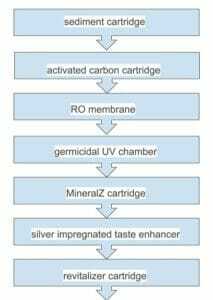 The germicidal UV stage of purification is consist of UV bulb. At this stage the water is exposed to the UV rays of the UV bulb which inactivates harmful bacteria and viruses from the water. The mineralz cartridge basically maintains the pH of the purified water. The ideal ph of pure water is 7. The pH below 7 is considered as acidic whereas when the pH exceeds 7, it is considered as basic. Usually the pH of water anywhere between 6.5 to 8.5 is acceptable for drinking. The mineralz cartridge basically helps to retain the essential natural minerals in the water which makes the water healthy and tasty. As the name suggests, this filter helps to enhance the taste of the water and it also removes the remaining impurities from the water. The revitalizer cartridge basically structures the water molecules which makes it biologically active that improves the hydration and mineral absorption. This water purifier comes with a unique i-protect water purification monitoring which basically monitors the water purification process and it will alert you with its indicator in case of any error. With the 7 stage water purification and some unique filters like revitalizer cartridge Havells Max RO UV has a very solid water purification solution. Havells Max RO UV comes with approximately 7-8 litre water storage tank. The build quality of the water storage tank is very good. It comes with ingress protection tank cover which stops external invasion of insects and dust particles. Full tank indicator– which will notify you whenever the water storage tank gets fully filled with pure water. You don’t have to manually turn off the water purifier when it is fully filled it will do it automatically. Error indicators– This indicator will notify you whenever there will be any kind of error in the water purification or any part of water purifier like whenever the UV bulb becomes inactive or the pump stops working etc. This water purifier is equipped with electrical protection system which basically protects the water purifier during voltage fluctuations, ensuring its long life. Overall the users are happy with the design and look of this water purifier. They are also happy with the purification of this water purifier. some users also found the maintenance of this water purifier a bit expensive. Havells Max RO UV water purifier has a very unique design which is very practical as well and it can be mounted in the corners or on the flat wall or on the table as well. It also have a partially transparent water storage tanks and a unique and convenient tap. It also comes with a glass holding tray which is detachable as well in case you want to fill large water bottles. 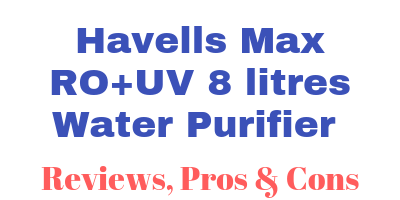 Havells Max RO UV water purifier also has a pretty solid 7 stage water purification with some unique cartridge like Mineralz cartridge and Revitalizer and I-protect water purification monitoring. So this water purifier can’t go wrong in water purification. With 7 stage water purification, this water purifier also has a little bit more maintenance cost. Also it has a pretty good alert system. It comes with very good additional features such as electrical protection system which protects the water purifier during voltage fluctuations. Overall if you are looking for RO water purifier with solid water purification system and a unique modern design then Havells Max RO UV water purifier is ideal for you. Q. Which water purification technology does Havells Max have? A. Havells Max comes with RO and UV water purification technology. The RO water purification technology helps to remove excess TDS from the water ultimately converting hard water into soft water. The UV water purification removes harmful bacteria, viruses and protozoa from the water making the water 100% microbe free. Q. How many total filters are present in havells Max? Q. Is pre filter required for this water purifier? A. It is not mandatory to have a pre filter but if you constantly get muddy water then it is a good idea to have a pre filter. It also helps to increase the life of other filters. Q. What is the life of RO membrane of this water purifier? A. The life of the RO membrane of any water purifier is really depends upon the quality of the water is purifies and the amount of water is purifies. For example the RO membrane will last for longer period of time if the usage of water is less and also if it have to purify low TDS water say of 500 PPM than if the water purifier have to purifier lot of high TDS water say of 1000 PPM. Q. How much time does it take to fill its water storage tank fully? A. The time is highly depends upon the quality of the water it have to purify and also the life of the filters. For example it will take way less time if the filters are new and the TDS of the water is low say for example 500 PPM than if the filters are old and it have to purify water of high TDS say 1000 PPM. Q. Does it cools or warms the water? A. No, it just purifies the water. Q. Does this water purifier good for purifying municipal water or bore well water? A. This water purifier has a RO membrane so it can remove the excess TDS from the bore well water. This water purifier comes with Mineralz cartridge whic basically helps to maintain the ideal pH of water. So it will retain the essential natural minerals in the water which may get removed during RO water purification. So overall Havells Max RO UV is good for bore well water as it can remove excess TDS from the water. And it is also good for purifying municipal water as it can retain essential natural minerals which may get removed during RO water purification. Q. What is the material of water storage tank of this water purifier? A. The water storage tank of this water purifier is made from food grade plastic which is non-toxic and durable as well. Q. Which indicators does this water purifier have? Power indicator- This indicator will notify you whenever the water purifier is on. Full tank indicator- This indicator will notify you whenever the water storage tank will get fully filled. Now you don’t have to turn off the water purifier once the water storage tank is fully filled it will automatically stop the purification process and it will automatically start the purification process once the water level decreases in the water storage tank.